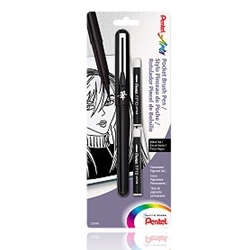 Pentel Pocket Brush Pen with Two Refills - Create fine to broad lines with a single brush stroke. Ideal for painting, cartooning, detailing, etc. Portable and refillable with permanent pigment ink. Pen comes with two refill cartridges of black ink. The ink is water and fade resistant when dry. The pen tip is made from man made bristles and comes to a fine brush tip. Made in Japan.